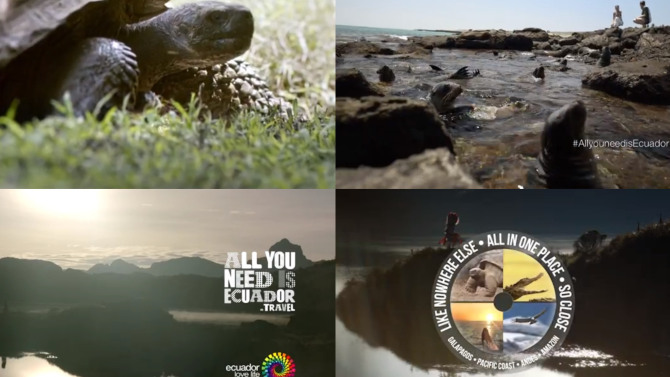 The “All You Need Is Ecuador” spot marks the first time a foreign government invests in a TV ad during a Super Bowl game broadcast. “Advertising during the Super Bowl means we dare to dream big,” said Ecuador’s Tourism Minister Sandra Naranjo at a press conference before the Big Game. The spot cost $3.8 million dollars, which is right in line with what any advertiser pays for 30 seconds of on-air time on Super Bowl Sunday. That may be pocket change for say, McDonald’s, but for Ecuador, which, according to Fusion, spent a total of $5 million on tourism advertising in all of 2013, it’s a huge investment. Being that Colombia, the U.S., and Peru generate the most tourists to Ecuador (in that order), the move made perfect sense. According to Naranjo, they’re expecting a 5% increase in U.S. visitors this year, equivalent to $60 million additional dollars in tourism revenue. That’s 15 times what they put in! Even if only 1% of the total audience of the Seahawks – Patriots game (114.5 million people) saw the commercial and decided to take an Ecuadorian vacation, that’s not bad at all, considering that, in total, 1.5 million people visited Ecuador in 2014. Given Rafael Correa’s usual rhetoric toward the U.S., it’s hard to believe he came up with this one on his own, but that’s apparently what happened, according to Ecuador’s Ministry of Tourism. Still, don’t expect him to show up at a football game anytime soon. With oil prices plunging by about 60% since last year, Ecuador has been forced to cut the nation’s budget by $1.4 billion in 2015. And with American shale production continuing to drive global oil prices down, that does not bode well for a country that exports about 300,000 barrels of crude a day. Even with a new $5.3 billion credit line from China, which, according to Finance Minister Fausto Herrera, is to be used for social spending, infrastructure and irrigation, Ecuador can no longer afford to rely entirely on oil. And the country knows that. With its substantial investment in tourism, the latter is expected to go from being the third largest source of income for the country, to the first, by 2017. It’s brick and mortar, too. Currently, there are some 25 new hotels being built in the country. If they’re anything like the Finch Bay Eco Hotel in the Galapagos, I’m in! Although the exact figure paid to license the Beatles’ “All You Need is Love” song for this campaign is undisclosed, it’s safe to assume it wasn’t cheap. When the AMC series “Mad Men” used the band’s “Tomorrow Never Knows” song in an episode — the version actually performed by the Beatles — they reportedly paid $250,000, according to the New York Times. Being that this was a cover of a Beatles song, Ecuador likely paid a lower figure. The ambitious campaign launched April 1, 2014, in several cities around the world. Giant, 19-foot letters, each one with a different design representing Ecuador, appeared simultaneously in emblematic places in Paris, Madrid, Sao Paulo, Bogota, New York, Santiago, Berlin, London, Lima, Mexico City, Amsterdam, and Buenos Aires (and within Ecuador in Cuenca, Manta, Loja, Guayaquil, Tena, Santa Cruz and Quito). The letters, which collectively spelled out the slogan “All You Need is Ecuador,” contained the #AllYouNeedIs hashtag, inviting people to interact with the campaign on social media. The second phase of the campaign launched in June 2014, aimed at international tour operators. The campaign’s momentum continued throughout the year: Ecuador closed 2014 with a 14% year-over-year growth in tourism; that’s 2 times more than the average for South America and 3 times more than the global average, according to the Ministry’s statistics. What you saw on Super Bowl Sunday is not a national campaign. It’s targeted to specific cities, including Miami, San Francisco and New York. But after the Super Bowl, I suspect a lot of people will be seeking it out online. Kudos to the creative team at Vertigo for producing such a beautiful tribute to mi lindo Ecuador.